“Well, that wasn’t so much fun,” said someone on our team whose real words shall not be revealed, as we got caught in heavy rain. Today we rode 63 miles from Clear Lake to Charles City. Storms were predicted for most of the day, and sure enough, they arrived mid-morning. Trying to out-ride the storm was almost but not quite successful, and seven of us sat in the SUV for ninety minutes, drying off while engaging in stimulating conversation. Then we were back on the road. Three observations. First, RAGBRAI is known for riders wearing outlandish costumes that express their character, interests, and passions. “Good morning, loons!” I shouted, as we passed two older women wearing loon-decorated bike helmets. I’ve seen the loon women every day and always greet them because loons are my favorite birds, drawing me back to childhood fishing trips to a remote lake in Quebec. 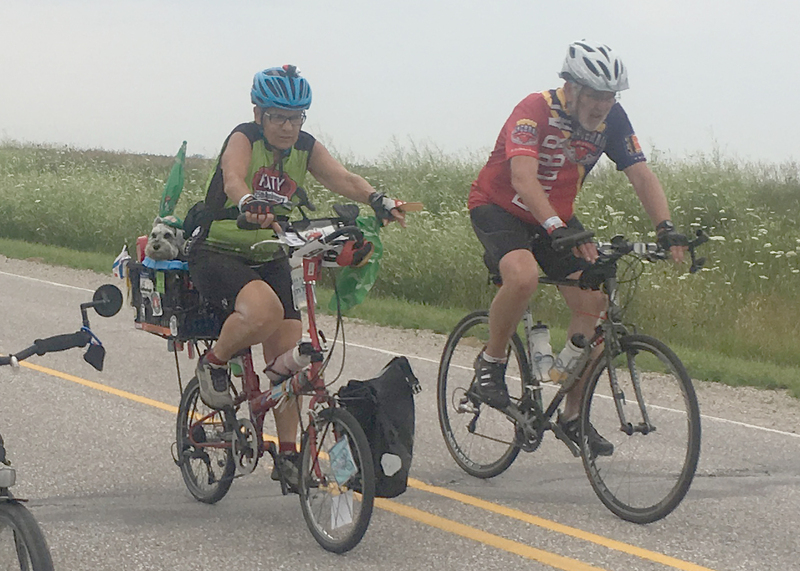 From dressing like pigs, babies, ballerinas, and unicorns, to riding a bike while carrying a dog in a backpack, RAGBRAI provides a source of endless wonder and enjoyment. Can you see the dog in the picture? Second, the four to six towns that provide food and entertainment every day serve up a variety of foods unique to Iowa and the Midwest. Admittedly, however, most of the food is not particularly healthy. Corn dogs, bacon ice cream, sausage burritos, and cheesecurds take center stage at RAGBRAI, and I haven’t seen a lot of salads. One RAGBRAI oddity is the sale of pickles and pickle juice. “A pickle for a dollar” gives you both the pickle itself and the juice, which is well known for preventing leg cramps and reducing inflammation and muscle soreness. We visited several UMC churches along the route today, including Swaledale, Rockford, and Charles City, where we were hosted overnight by Pastor Jim and Jane Beranek. 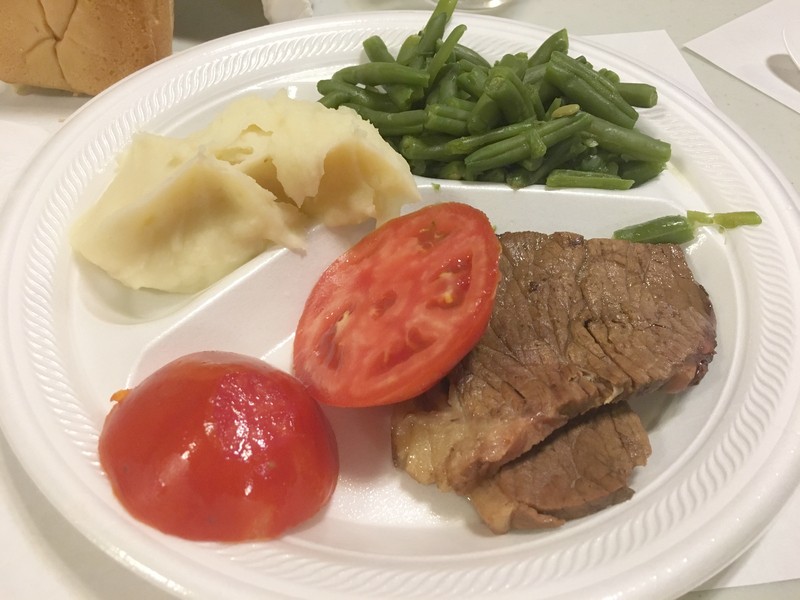 Although Swaledale ran out of the 500 homemade cinnamon rolls and 500 breakfast burritos before we arrived, we were able to enjoy Methodist pie at Rockford and a roast beef dinner at Charles City. The premier ride of the Air Force’s Cycling Team is RAGBRAI. Every year a hundred rider showcase the Air Force by pledging to help everyone who has pulled over. More than once, when I have been waiting for a team member by the road, an Air Force cyclist has stopped to ask if I need assistance. Pretty amazing! We had a great day despite the rain, and tomorrow will be even better, with no rain in the forecast. Ride on! 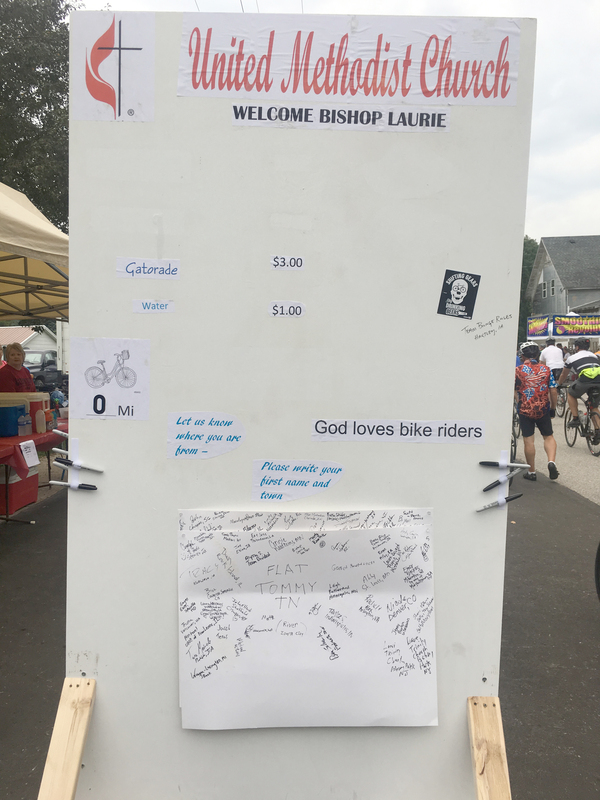 OK, Bishop Laurie! 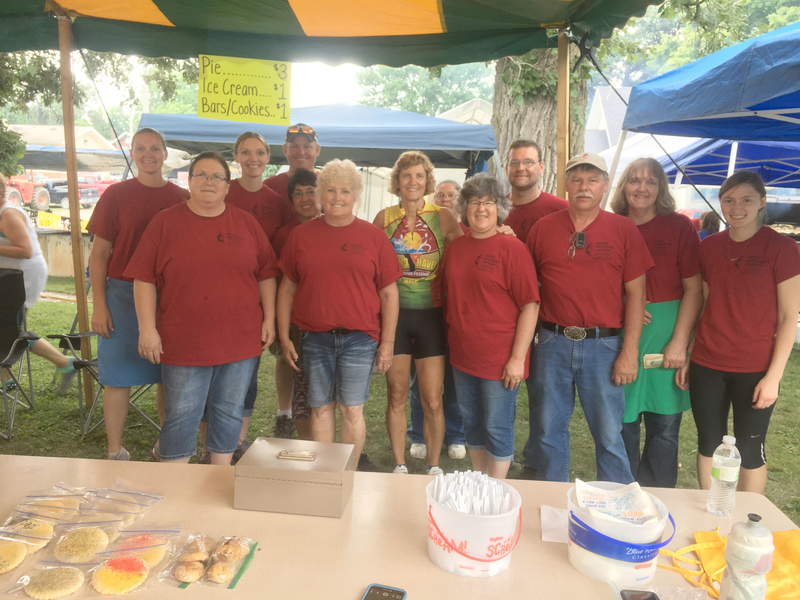 Time to get a Methodist Mission RAGBRAI Team organized! Count me in! Time to augment the Air Force Team. Looks like a fun day. Also challenging!